For up to date information we recommend you see this face book page. 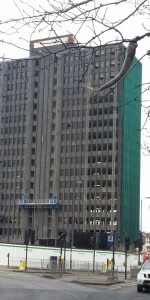 Work has started at the Colliers Wood Tower. Merton Council has this week won a total of £4.45m to improve areas of the borough which are run down. Around £3.7m from the Greater London Authority’s regeneration fund, will go towards ambitious new plans to create a new town centre for Colliers Wood and Merton High Street in South Wimbledon. Some of the funding will help transform Merantun Way into a boulevard with cycle lanes and footpaths, improving access from High Path and Merton High Street to the historic Abbey Mills and South Wimbledon Business Area. More info here. A new concept from Housebites.com brings Cuban cuisine to the Colliers Wood area. The fantastic tastes of Cuban food can now be enjoyed by ordering online through the housebites website. But beware – it took us three attempts to place an order, as the website although it looks professional doesn’t work too well. We sent a follow up email but got a dismissive response and had to order another day! The food, however, when it arrived was simply fantastic, so lets hope the site can get its act together as its a great concept. 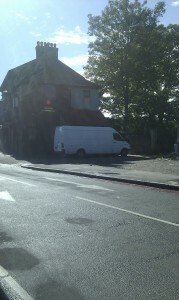 The Olympic torch is coming to Colliers Wood so expect big delays and disruption on July 23rd. More information here. While small businesses and individuals have been told to brace for disruption those working for London transport and other public sector companies will receive big bonuses for doing their jobs. The River Wandle which runs through the heart of Colliers Wood now “the healthiest for over 20 years”. Officially declared a sewer in the 1960s the Wandle has been transformed. With help from Defra’s £110m funding extensive work has been done by the Environment Agency, water companies and landowners, and we’re now seeing fish and mammals, including salmon and otters, thriving once more. Visitors to Merton Abbey Mills will often see Anglers at weekends. The are signs of a new curry restaurant ‘Coming Soon’ to Colliers Wood. Abbey Mills restaurant Mamma Rosa stars in Channel 5 Show. 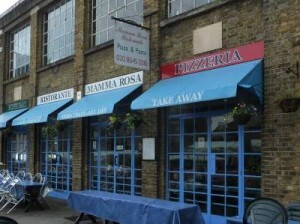 We are not sure why they bothered as Mamma Rosa is a great restaurant by the river Wandle at Abbey Mills. The colour scheme has changed and the new colour doesn’t feel Italian. After several days Boots at the Tandem Centre is now open. Dispite the windows remainig boarded up the store proudly decares it’s open for business once again. 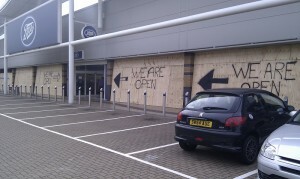 In a similar move Ladbrokes, also ransacked by the maurauding hords, reopened with boarded windows on Tuesday. The River Wandle runs through Colliers Wood. The river is heavily managed with artificial channels, runoff ditches and subterranean trenches. Few local residents realise that the stretch of the river running past Merton Abbey Mills craft village and in front of Sainsbury's is actually man-made. Popular British TV police drama 'The Bill' is frequently filmed in and around Colliers Wood. Colliers Wood is home to Deen City Farm and riding stables which offers children's events and educational programmes. Entrance is free. The local Football team is Colliers Wood United F.C and it is a non league club. The nearest tube stations are Balham, Tooting Bec, Tooting Broadway, Colliers Wood and South Wimbledon. Colliers Wood is in underground zone 3.